The Museum of Contemporary Art in Belgrade was designed by architects Ivanka Raspopović and Ivan Antić, the First prize winners at the competition held in 1959-1960. Their project included six crystal-formed cubic modules placed on a rectangular base and rotated by 45 degrees with a tendency to be, theoretically, multiplied in the future. The combination of glass, concrete and white marble on the facade gave this edifice a sophisticated image in accordance with its purpose. 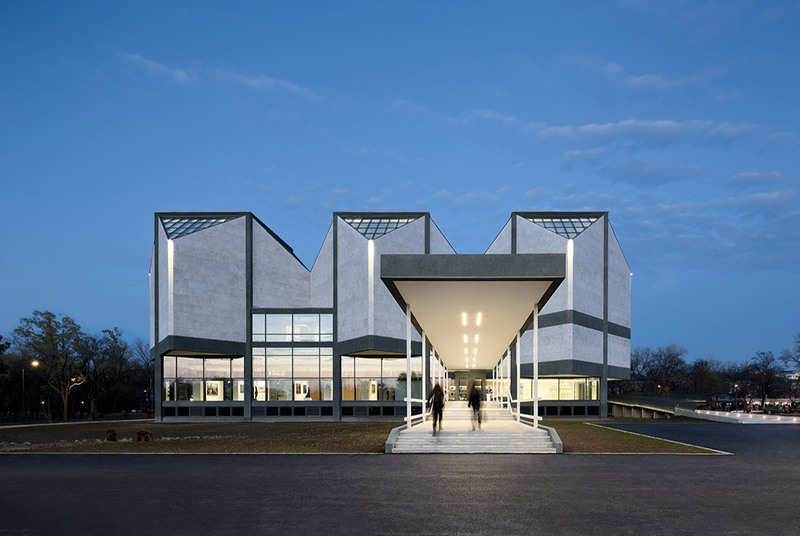 Located on the confluence of the Sava and Danube rivers, the museum was opened in 1965. The initial concept was to convert park area into a museum quarter. However, the idea was never realized and the Museum of Contemporary Art remained a solitary bastion of Yugoslav modern art. Ivanka Raspopović and Ivan Antić were awarded the October prize for their project. The building was declared a monument in 1987. Due to the grave need for renovation, the museum was closed in 2007. The reconstruction process begun, but after the finishing new power station nearby museum building in 2010, the entire project was put under a halt due to the lack of funds. After many delays, the renovation of the museum continued in September of 2016. The new project was designed by architect Dejan Todorović in only three months. The museum was finally open for public in October 2017, after ten years of being closed. The almost invisible intervention of Dejan Todorović reveals a rare but necessary approach in terms of reconstruction, restoration and conservation of architectural heritage. Although his career was mostly based in Spain, in 2013 Dejan Todorović designed a building in Bregalnička St. in Belgrade, which was awarded by the Belgrade Salon of Architecture. With this project Todorović showed an exceptional sense for the ambience, which will prove to be valuable for his future task. In 2016 he was invited to revise the old reconstruction project of the Museum of Contemporary Art in Belgrade from 2007 and to proceed to the second phase of renovation. The reconstruction of the museum was a very difficult, complicated and overall challenging project, since the building needed to be adapted to the latest museum standards without losing its original materialization and design. The iconic image of the museum’s architecture also represented an additional burden and there was no room for improvisation. Another challenge was that the reconstruction should have been conducted in such a manner that all forms of contemporary art could be displayed within the museum interior. On the other hand, the building was designed in such a way that it did not leave many options for interventions. 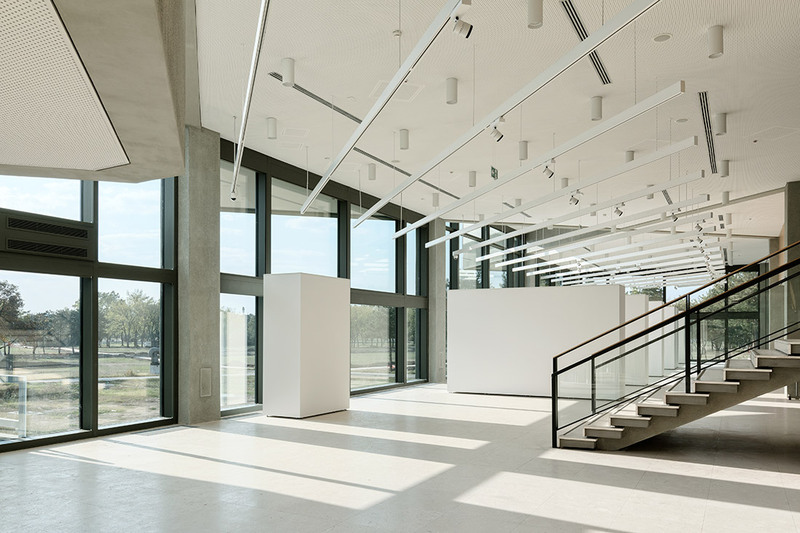 One of the most unique features of the Museum of Contemporary Art in Belgrade is its interior, which is fluid, abundant in the natural light and it is lacking walls so that the visitors would walk through all the five semi-levels without losing the notion of entire exhibition. Therefore, specific restructuration needed to be applied. What Dejan Todorović did first was to talk with all the museum’s employees about the reconstruction project. This dialogue between the architect and the client opened many important issues. One of them was the wheelchair access to all museum levels. The elevator did not reach the two levels of the museum, so elegant and discrete vertical platforms were installed without interfering with the fluidity and the initial quality of the museum’s interior. New wheelchair ramp was also built in exterior connecting terrace of new power station with newly formed secondary access. Another challenge was the lighting. The original lighting was based on completely different principles, which now needed to be changed. The new technologies needed to be adapted to all forms of art exhibitions and the contemporary museum standards. 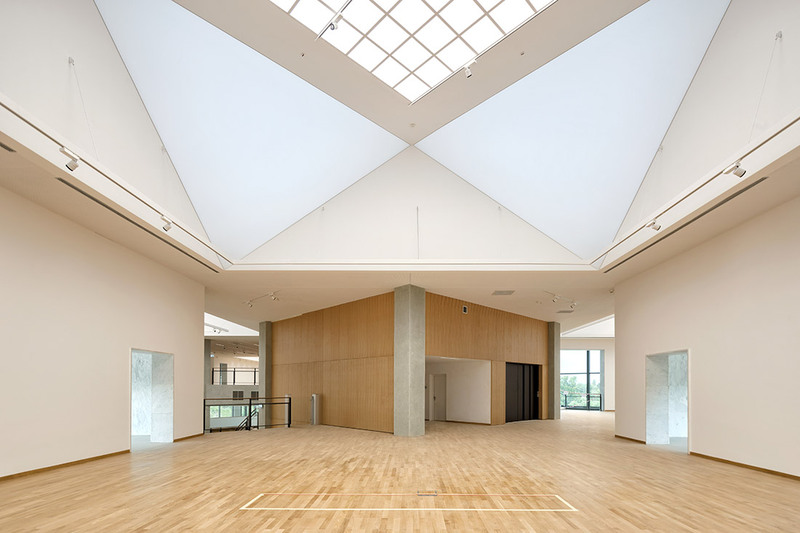 Also, instead of the horizontal skylights in 60×60 cm modules in each cuboid, the exterior cube octahedron dome geometry was repetitively applied in interior by using specially designed multilayered triangular screens, which also enabled complete control of the natural light, higher ceiling and an adequate culmination of the interior. A new heating and cooling system was also one of the most important features of the reconstructed museum. In accordance with the current standards, the building is now “smart”. Finally, the new materials used for restoration were carefully chosen in order to be as close to the original ones as possible. Although the Cultural Heritage Protection Institute of the City of Belgrade set very rigid parameters for the reconstruction, the original design provided the solution for each of the obstacles. Dejan Todorović therefore highlighted the exceptional quality of the original project, which managed to endure the changes in technology without losing any of its quality features. The museum’s architecture is timeless and therefore continues to be contemporary even though it was designed more than fifty years ago. Its geometric and rational form was preserved due to the architect’s understanding of the building’s formal articulation. 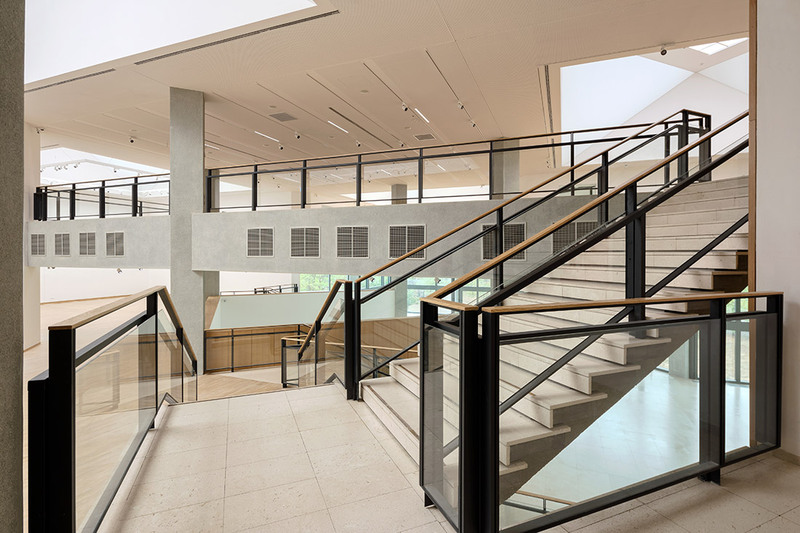 The only additional element to the existing building is the ramp and the relocated power station, which did not disturb the ambience of the museum and its landscape environment. Todorović also stated that the collaboration between the Cultural Heritage Protection Institute of the City of Belgrade, the Museum of Contemporary Art, the contractors and himself was exceptionally good. For the renovation of the Museum of Contemporary Art Dejan Todorović won Grand Prix at the Salon of Architecture in Belgrade, Prize of City of Belgrade for architecture and urbanism and also selected shortlisted for Mies Award 2019. It can be concluded that the main reason why this reconstruction was a success lays in the fact that interventions did not change the building’s original appearance. This can be explained with architect Todorović’s own words that for experienced engineers the more limitations they have – the better their result is. Another important factor is his respect for the architectural heritage. Todorović did not look upon such a project task as his own original work where he would be its new author. This is especially visible through minimal and discrete interventions. The admiration Dejan Todorović showed towards the work of Ivanka Raspopović and Ivan Antić is immense and was crucial for the overall result. The beauty of the original architecture was left intact. 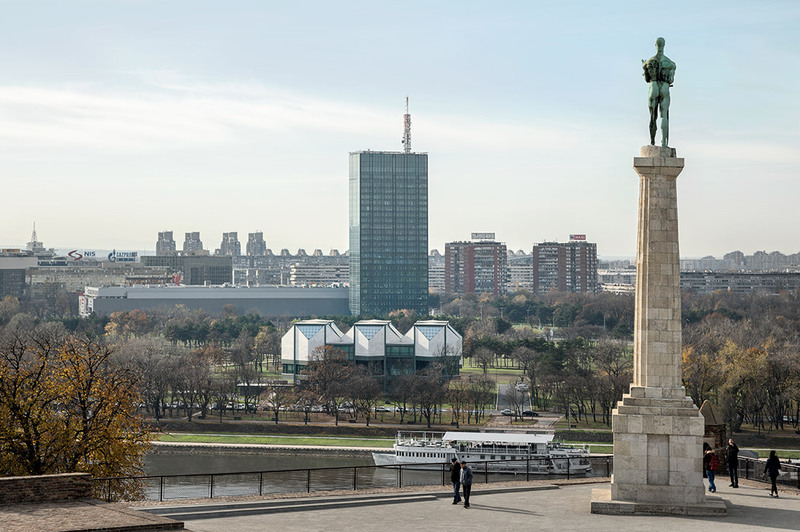 The reconstruction of the Museum of Contemporary Art in Belgrade set an example for all the future renovation projects in Serbia and hopefully it has set a path which the other architects would follow.